Established in 1878, the Louisiana Dental Association (LDA) is the largest professional health organization for dentists in Louisiana. It is a statewide grassroots organization whose purpose is to promote, advocate, and protect the dental professional. The LDA has nearly 1,900 members. 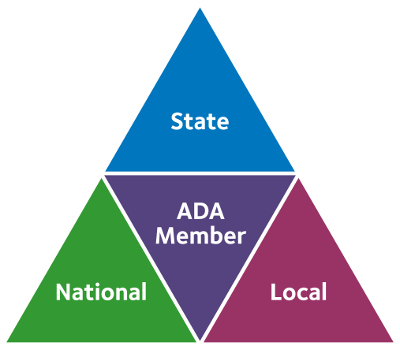 LDA members are actually part of a “tripartite” system, meaning they fill out one membership application and pay one dues amount and are members of the American Dental Association (ADA), the LDA, and their local component dental society. Our members actually have three advocate groups. The local component dental society in your area provides camaraderie and local support. The LDA is made up of nine component societies covering each major area of the state. Each holds organized meetings, special events and seminars. Together, the three groups form as The Power of Three. The Power of Three is an initiative to ensure that members are the central focus of our work at the local, state and national levels. It represents our ongoing commitment to deliver outstanding service, benefits and products at every point of contact with our members. Through these efforts, we hope to build and enhance member value throughout the association, providing every dentist a reason to join, and every member a reason to stay. The LDA promotes your services, represents your needs and provides support services and continuing education events on a state level, while the ADA provides similar services on the national level. Our members deserve an incredible membership experience, which means valuable benefits and outstanding service - and the promise to continue to improve. Visit our membership link to find a detailed list of membership benefits, as well as an application to join the “tripartite” system. Thank you for being our member and a part of organized dentistry!